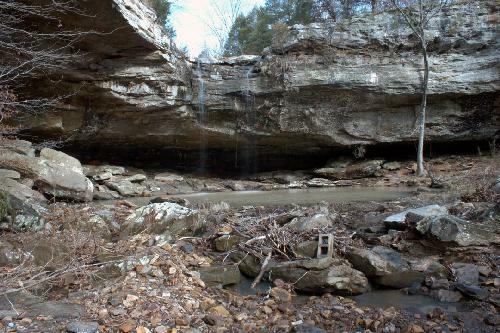 Here is a photo of another waterfall at Ferne Clyffe Falls State Park in southern Illinois sent to me from Jeff. He said, "There's a watercourse west of the main waterfall near the parking lot (not the stream from the main waterfall) where two streams converge forming a series of falls. We found another one today in the western portion of the park off Regent Lane (really close to the road, in fact). Actually, it's on the map so find is a relative term, but the western portion of the park is somewhat undeveloped compared to the eastern portion of the park."